Thai beer does not taste good and I’m realizing this as I sit in my house on a rainy Sunday evening at 6:07 p.m. on the 12th of June, 2011. I’m realizing this because yesterday I bought six cans of beer at a store in Sangka – two Singha, two Chaang and two Heineken. I drank a Singha yesterday and it felt like I was eating a strange fruit for the benefit of the person who gave it to me. It’s Sunday, I biked to a distant village to find the school under the hot Thailand sun, my arms and neck are burned, I’ve read over 100 pages of a fantastic John Irving novel and I’m a Peace Corps volunteer in a strange land where I understand about one out of every five words out of the natives’ mouths. For these reasons, I told myself I deserved one of those Heinekens even though they’re a bit pricy for a volunteer’s salary. As I drank it I thought of the stupid joke I always use when drinking a Heineken with other people. Feel how cold this beer is, I say. The unsuspecting female feels it and I say, get your hands off my Heinie! It’s incredibly juvenile, but tends to get a laugh, even if it’s only for courtesy. I mainly thought about how damn delicious it is. It’s damn delicious on its own, but it’s the best beer I’ve had in six months when I think about the Singha, Chaang and Leo I’ve been drinking. 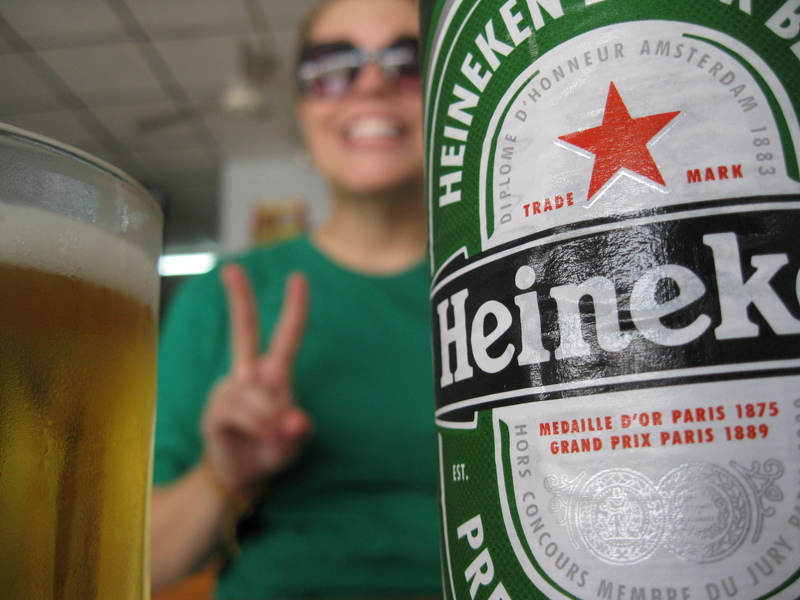 Comparing Heineken to Thai beers is like comparing John Irving novels to Janet Evanovich. They shouldn’t even be in the same conversation. Then I thought, I love Pearl Jam, as I listened to the Halloween Philadelphia bootleg from 2009. But that’s beside the point. The best thought of all I had while drinking the delicious Heineken was, I’m having the other one, too. Editor’s note: The finishing of this blog coincided with the second Heineken. Okay, so Sunday's Heinekens weren't the only ones I've had, but they were the only ones I've had near Microsoft Word. This entry was posted in Peace Corps and tagged beer, ernest hemingway, heineken, janet evanovich, john irving, thailand by Jeff Jackson. Bookmark the permalink. I was one of those unsuspecting females and laughed every time, even when I saw you do it to others and knew what was coming. Only you can get away with those juvenile jokes without me wanting to punch you. I think of it every time I see someone else drinking a Heine.